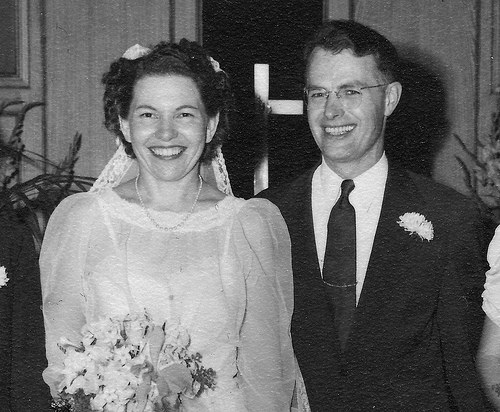 My parents, Eleanor and Allen Searls, were married 65 years ago today. The wedding was in Grace United Methodist Church, in Minneapolis. * Mom’s family, all descendents of Swedish immigrants to homesteads in Minnesota and North Dakota, were the primary attendees, as I recall being told. Pop’s family was from New Jersey, and that’s where the couple settled down and raised their family. Additions were myself, a bit less than a year later, and my sister Jan, another 20 months after that. We were lucky kids. Our parents were good, sane, loving, smart, hard-working and convivial people. Our home was a safe and happy one. We had lots of family gatherings, and lots of friends in our town and around the little summer place Pop and uncle Archie Apgar built on the edge of the Pine Barrens in South Jersey. For us that place was paradise. So here’s a toast to Mom and Pop. We love ya both, and always will. *Today that’s Northeast United Methodist Church, and it’s not clear to me if the church where Mom and Pop got married is the one still at 2510 Cleveland Street N.E., or the one the website says is for sale at 2511 Taylor St. N.E. I suspect not, though, since the picture of that church, called Trinity United Methodist Church, doesn’t have steps like the ones we see in this picture of Mom and Pop leaving the church after the wedding. On Aug 17, 1946, I was fresh out of high school, living at 2117 22nd Ave. N.E., Mpls — two blocks from the church at 2510 Cleveland — a church that I attended for awhile — except I think that it was a United Brothern Church back then. The Taylor location was about a mile away. Both of those locations were on Lowry Avenue (same as 25th Ave) — a primary crosstown bus route. BTW, do you know where your mother lived and her maiden name?? Mom’s maiden name was Oman. Sponberg is the family on Mom’s mother’s side. The last remaining Sponberg family farms and businesses in Minnesota, far as I recall (which isn’t far enough) are around New Richland. But I’m sure there are plenty of Omans, Ohmans (another spelling) and Sponbergs scattered around the prairie. Mom and her sibs grew up in Napoleon, North Dakota. Only her brother Arlie stayed around, working most of his life for the state highway department. His three kids grew up in Hillsdale. That generation and the ones following are now on the coasts. (The best known is Andy Heck, co-captain of the last Notre Dame football team to win a national championship, and now a 20-year veteran of the NFL, coaching with the Jacksonville Jaguars.) The three sisters, including Mom, scattered to Persia, Alaska and Seattle, then got married and settled in California, New Jersey and North Carolina — before all of them gathered in Graham, NC after retiring. I’m not sure why they picked Grace Methodist to get married in. I’m guessing that Mom was staying nearby with family while preparing to move to New Jersey after she got married, and it was central for all the relatives on her side. I guess from your report that the church they got married in could have been either of the ones on Lowry. While we have a copy of the invitation, it doesn’t give the location. And none of the pictures show much of the church exterior. Thanks Doc. You’re really generous with this blog. Ciao, I hope to meet you in Florence next time you came here… To Vineria in Via dei Neri?